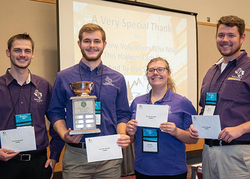 The Stephen F. Austin State University student chapter of the Society of American Foresters clinched the national title of Society of American Foresters Quiz Bowl Champions, defeating 32 collegiate teams from across the U.S. Pictured from left to right are SFA quiz bowl team members Reid Viegut, Christopher Longman, Rachel Murray and Justin Blakeley. NACOGDOCHES, Texas - For the first time in the chapter's decades-long history, the Stephen F. Austin State University student chapter of the Society of American Foresters clinched the national title of Society of American Foresters Quiz Bowl Champions, defeating 32 collegiate teams from across the U.S. during this year's national convention held in Portland, Oregon. "It's very rewarding to see the early morning practices, as well as the hard work and persistence finally pay off," said Dr. Rebecca Kidd, assistant professor of forestry at SFA and SAF faculty advisor. "The range of topics includes forest resources, which encompasses wildlife, habitat management, hydrology, soil science, silviculture, ecology, spatial science, agro-forestry, recreation management, policy and economics," Kidd said. "One of the questions we answered correctly was something we just learned in forest hydrology two weeks ago," Longman said. "In our quarterfinal match, we went into overtime in sudden-death format," Longman said. "That was probably the most nervous moment we experienced." Longman added that the team's victory is a definite reflection on the quality academics offered at SFA. To learn more about the majors offered through SFA's Arthur Temple College of Forestry and Agriculture, visit atcofa.sfasu.edu.